Background/Aim: Transposition of the great arteries (TGA) is traditionally classified as a “conotruncal heart defect”, implying that TGA evolves from abnormal development of the outflow tract (OFT) of the embryonic heart. However, recently published genetic data suggest that TGA may be linked to laterality gene defects rather than OFT gene defects. The aim of our study was to clarify whether there is any statistically significant link between TGA and clinically diagnosed laterality defects (heterotaxy). Methods: Retrospective cross-sectional analysis of 533 patients diagnosed with TGA at our cardiac center over a period of 13 years (2002-2015). 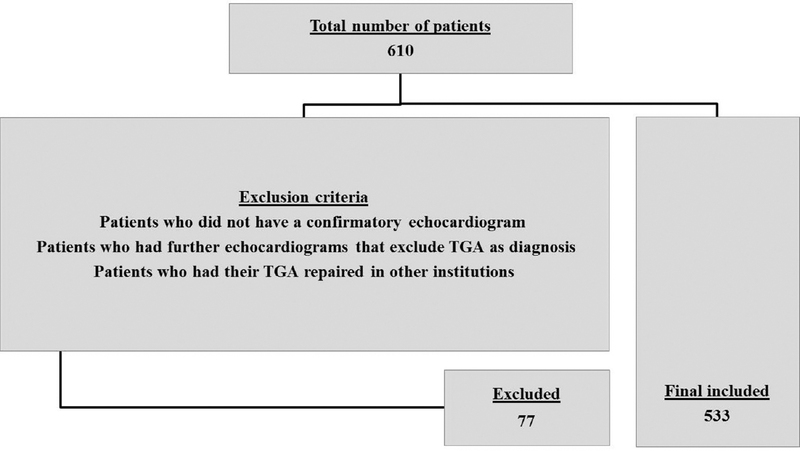 Hospital informatics and digital data recording systems were used for collecting patients' data and all patients were reviewed to check the echocardiograms for verification of the diagnosis, type (TGA, congenitally corrected TGA (ccTGA), and levo-position of the great arteries (LGA)), complexity of TGA, and all other variables (e.g., abdominal organ arrangement, cardiac position, presence or absence of other cardiac defects). 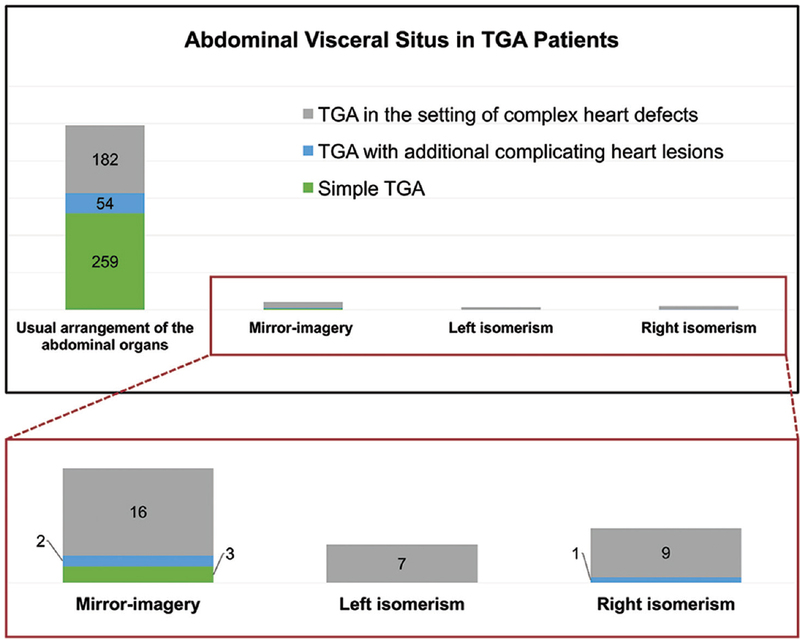 Results: Of 533 TGA patients, 495 (92.9%) had the usual arrangement of the internal organs, 21 (3.9%) had mirror-imagery, 7 (1.3%) had left and 10 (1.8%) had right isomerism. 444 (83.3%) patients had TGA. The number of patients who had usual visceral arrangement in each TGA type was: 418 (94.1%) in TGA, 49 (92.4%) in ccTGA, and 28 (77.7%) in LGA. 6 (1.4%) TGA patients, 4 (11.1%) patients with LGA were found to have right isomerism, while no ccTGA patient presented with this asymmetry. 4 (0.9%) TGA patients, 1 (1.9%) ccTGA patient and 2 (5.6%) patients with LGA had left isomerism. Heterotaxy (mirror-imagery, left and right isomerism) was more associated with LGA than TGA or ccTGA with a statistically significant difference (P value of 0.001). Conclusion: In contrast to recently published genetic data, our morphological data do not disclose a significant link between TGA and heterotaxy. In contrary to earlier definitions used by many clinicians, in our study the term “heterotaxy” is defined as any departure from the normal arrangement of the inner organs as proposed recently by Anderson et al. [Figure 1]. In the setting of usual arrangement of the internal organs (referred to earlier as “situs solitus”), the thoraco-abdominal organs are lateralized, differing in the anatomical features of their right and left sides [Figure 1] - left-hand panel]. The second pattern, earlier usually described as “situs inversus” represents lateralized thoraco-abdominal organs in a mirror-imaged variant of the usual bodily arrangement, which is a clear departure from the normal [Figure 1] - second left-hand panel]. Two other settings within heterotaxy are characterized by visceral symmetry rather than asymmetry. These bodily arrangements are named “right isomerism” [Figure 1] - second right-hand panel] and “left isomerism” [Figure 1] - first right-hand panel]. They are characterized by the presence of bilateral right-sidedness or bilateral left-sidedness of the inner organs, respectively. Thus, in patients with right isomerism, both atrial chambers have a large and pyramid-shaped (morphologically right) atrial appendages, both lungs have three lobes (morphologically right lungs), and the abdominal situs is frequently characterized by the absence of the spleen (asplenia). 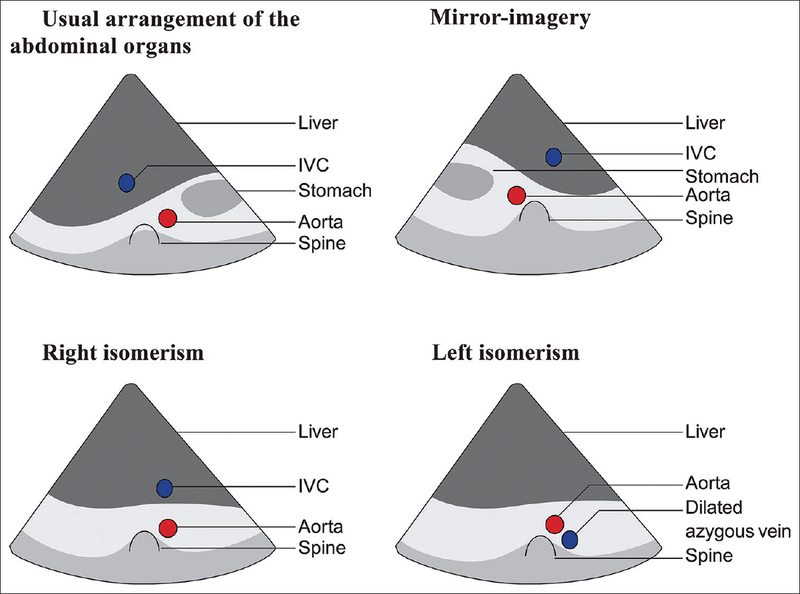 In patients with left isomerism, on the other hand, both atrial chambers have small and finger-shaped (morphologically left) atrial appendages, both lungs have two lobes (morphologically left lungs), and the abdominal situs is frequently characterized by the presence of multiple spleens (polysplenia) [Figure 1] - first upper row]. Patients who had their primary lesion (TGA) repaired at other institutions, and were then transferred to this center. How many of the identified TGA patients also had a confirmed heterotaxy (laterality defects)? How many of the TGA patients with heterotaxy belonged to the group of right isomerism? How many patients with TGA and atrioventricular septal defects had right isomerism? How many TGA and dextrocardia patients had usual arrangement of the internal organs (situs solitus)? 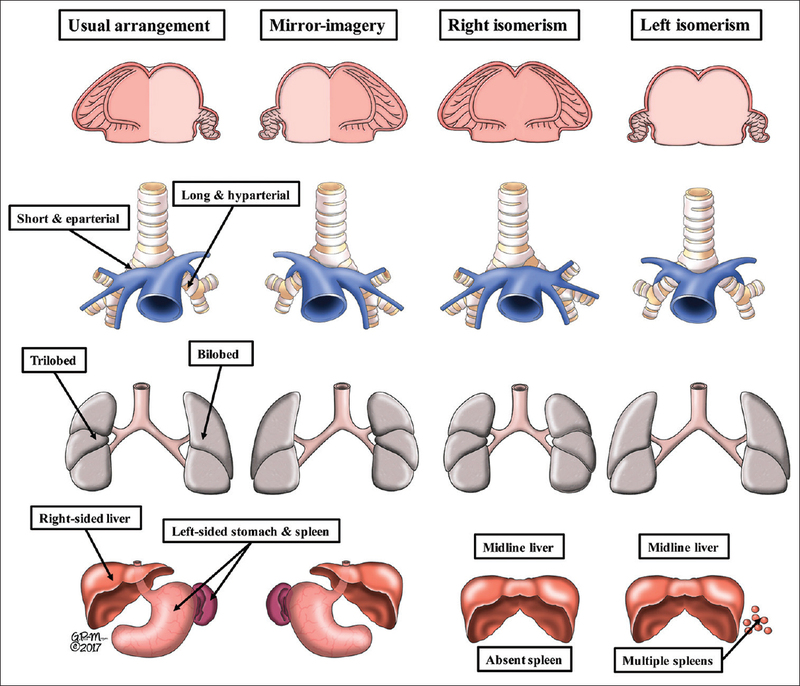 The best method for diagnosing heterotaxy would have been by utilizing the chest X-rays to identify the bronchial tree anatomy [Figure 1] - second upper row]. 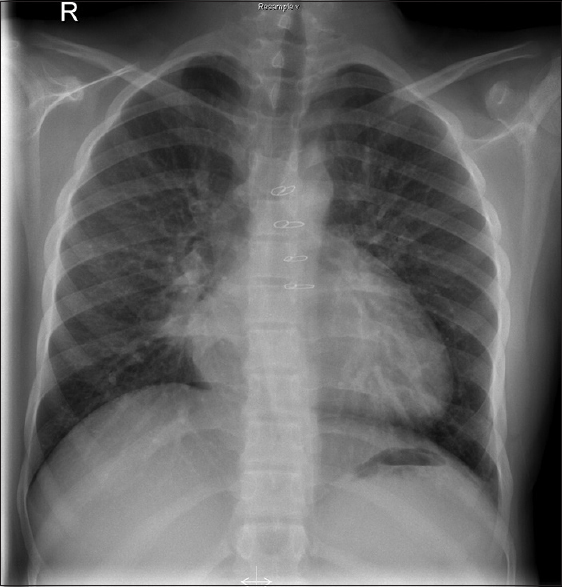 In the present retrospective study, this was not applicable due to the low quality of the available chest x-rays [Figure 3]. Therefore, we decided to determine the arrangement of the abdominal organs on the basis of the echocardiograms in the abdominal transverse plane [so-called subxiphoid/subcostal views, [Figure 4]. The definitions that were used to determine the sidedness were: usual arrangement (situs solitus) is when the aorta and inferior caval vein lie apart, on opposite sides of the spine, with the aorta on the left. Mirror-imagery is the mirror-imaged arrangement with the aorta on the right and the inferior caval vein on the left. Right isomerism is when the aorta and inferior caval vein are on the same side of the spine, with the vein slightly anterior. Left isomerism is when the aorta is in the midline and the azygos vein is located in a posterolateral position. This diagnostic sub-group included all cases of TGA without additional complicating cardiovascular lesions, such as pulmonary stenosis, coarctation of the aorta, and double outlet right ventricle. Patients who had TGA with ventricular septal defects that did not affect their clinical presentation, or led to a different initial surgical approach (such as pulmonary artery banding) were included in this sub-group as well. The main characteristics of Simple TGA patients are shown in [Table 1]. 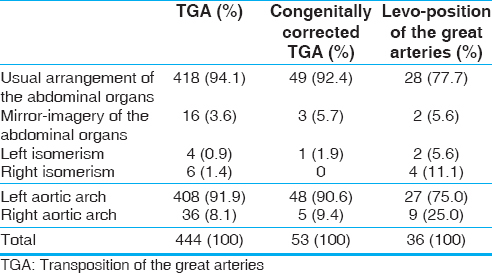 38 (7.1%) patients had heterotaxy, out of this group 26 (68.4%) had TGA, 4 (10.5%) had congenitally corrected TGA, and 8 (21.1%) had levo-position of the great arteries [for more detailed results see [Table 2] and [Table 3]. Atrioventricular septal defects were found in 28 (5.3%) patients with TGA, out of which 22 (78.6%) had heterotaxy, consisting of 8 (28.6%) with mirror-imagery of the abdominal organs, 5 (17.9%) patients were found to have left isomerism while 9 (32.1%) patients were diagnosed with right isomerism [Figure 5]. In the left aortic arch group (a total of 483 (90.6%) patients), 13 (2.7%) patients had heterotaxy, 10 (76.9%) of which were diagnosed with TGA, 1 (7.8%) was diagnosed with congenitally corrected TGA, and 2 (15.4%) were diagnosed with levo-position of the great arteries, while in the right aortic arch group (a total of 50 (9.4%) patients), 25 (50.0%) patients had heterotaxy, 16 (64.0%) of which were diagnosed with TGA, 3 (12.0%) were diagnosed with congenitally corrected TGA, and 6 (24.0%) were diagnosed with levo-position of the great arteries [Table 4]. Given the fact that the higher association of levo-position of the great arteries and heterotaxy is seen only in patients in which the primary heart lesion is not TGA (but a complex heart defect with abnormal positioning of the great arteries in any form as an additional finding), to establish a true link is impossible. Therefore, even the association between levo-position of the great arteries and heterotaxy is under question for cofactors resulting in this link, namely the other major cardiac anomalies. This can be clearly seen when looking at all the heterotaxy patients in our population, which is a total of 38 patients (including patients with mirror-imagery as departure from normal), 32 (84.2%) of which were patients in the sub-group of TGA in the setting of complex heart defects, only 3 (7.9%) of which were patients in the sub-group of TGA with additional complicating cardiovascular lesions, and 3 (7.9%) of which were patients in the Simple TGA sub-group, showing that the possible association between heterotaxy and other major cardiac lesions is more likely than the association between heterotaxy and TGA [Figure 6] and [Table 1]. Unolt M, Putotto C, Silvestri LM, Marino D, Scarabotti A, Valerio Massaccesi, et al. Transposition of great arteries: New insights into the pathogenesis. Front Pediatr 2013;1:11. Ashworth M, Al Adnani M, Sebire NJ. Neonatal death due to transposition in association with premature closure of the oval foramen. Cardiol Young 2006;16:586-9. Ferencz C, Rubin JD, Loffredo CA, Magee C. The Epidemiology of Congenital Heart Disease the Baltimore-Washington Infant Study (1981-1989). Perspectives in Pediatric Cardiology. Vol. 4. Mount Kisco NY. : Futura Publishing Co., Inc.; 1993. Fyler DC, Buckley LP, Hellenbrand WE, Cohn HE. Report of the New England regional infant cardiac care program. Pediatrics 1980;65:375-461. Samánek M. Congenital heart malformations: prevalence, severity, survival, and quality of life. Cardiology In The Young 2000;10:179-85. Ferencz C, Brenner JI, Loffredo C, Kappetein AP, Wilson PD. Transposition of great arteries: Etiologic distinctions of out flow tract defect sinacase- control study of risk factors. In: Clark EB, Markwald RR, Takao A, editors. Developmental Mechanism of Heart Disease. Armonk, New York: Futura Publishing; 1995. p. 639-53. Burggren WW. Cardiac design in lower vertebrates: What can phylogeny reveal about ontogeny? Experientia 1988;44:919-30. Ramsdell AF. Left-right asymmetry and congenital cardiac defects: Getting to the heart of the matter in vertebrate left-right axis determination. Dev Biol 2005;288:1-20. Schleich JM, Abdulla T, Summers R, Houyel L. An overview of cardiac morphogenesis. Arch Cardiovasc Dis 2013;106:612-23. Horsthuis T, Christoffels VM, Anderson RH, Moorman AF. Can recent insights into cardiac development improve our understanding of congenitally malformed hearts? Clin Anat 2009;22:4-20. Ward C, Stadt H, Hutson M, Kirby ML. Ablation of the secondary heart field leads to tetralogy of fallot and pulmonary atresia. Dev Biol 2005;284:72-83. Yelbuz TM, Waldo KL, Kumiski DH, Stadt HA, Wolfe RR, Leatherbury L, et al. Shortened outflow tract leads to altered cardiac looping after neural crest ablation. Circulation 2002;106:504-10. Bajolle F, Zaffran S, Kelly RG, Hadchouel J, Bonnet D, Brown NA, et al. Rotation of the myocardial wall of the outflow tract is implicated in the normal positioning of the great arteries. Circ Res 2006;98:421-8. Goor DA, Edwards JE. The spectrum of transposition of the great arteries: With specific reference to developmental anatomy of the conus. Circulation 1973;48:406-15. Rokitansky KF. Die Defekte der Scheidewande des Herzens. Vienna: W. Braumuller; 1875. Le Lièvre CS, Le Douarin NM. Mesenchymal derivatives of the neural crest: Analysis of chimaeric quail and chick embryos. J Embryol Exp Morphol 1975;34:125-54. Anderson RH, Spicer DE, Loomba R. Is an appreciation of isomerism the key to unlocking the mysteries of the cardiac findings in heterotaxy? J Cardiovasc Dev Dis 2018;5. doi:10.3390/jcdd5010011. Marino B. Patterns of congenital heart disease and associated cardiac anomalies in children with Down syndrome. In: Marino B, Pueschel SM, editors. Heart Disease in Persons with Down Syndrome. Baltimore, MD: Paul H Brookes Publishing; 1996. p. 133-40. Mohapatra B, Casey B, Li H, Ho-Dawson T, Smith L, Fernbach SD, et al. Identification and functional characterization of NODAL rare variants in heterotaxy and isolated cardiovascular malformations. Hum Mol Genet 2009;18:861-71. Anderson RH, Wilkinson JL, Arnold R, Becker AE, Lubkiewicz K. Morphogenesis of bulboventricular malformations. II. Observations on malformed hearts. Br Heart J 1974;36:948-70. Marino B, Capolino R, Digilio MC, Di Donato R. Transposition of the great arteries in asplenia and polysplenia phenotypes. Am J Med Genet 2002;110:292-4. Casey BK. Genetics of human left-right axis malformations. In: Harvey RP, editor. Heart Development. New York: Academic Press; 1999. p. 479-89. Nomura M, Li E. Smad2 role in mesoderm formation, left-right patterning and craniofacial development. Nature 1998;393:786-90. Gebbia M, Ferrero GB, Pilia G, Bassi MT, Aylsworth A, Penman-Splitt M, et al. X-linked situs abnormalities result from mutations in ZIC3. Nat Genet 1997;17:305-8. Ware SM, Peng J, Zhu L, Fernbach S, Colicos S, Casey B, et al. Identification and functional analysis of ZIC3 mutations in heterotaxy and related congenital heart defects. Am J Hum Genet 2004;74:93-105. De Luca A, Sarkozy A, Consoli F, Ferese R, Guida V, Dentici ML, et al. Familial transposition of the great arteries caused by multiple mutations in laterality genes. Heart 2010;96:673-7. Goldmuntz E, Bamford R, Karkera JD, dela Cruz J, Roessler E, Muenke M, et al. CFC1 mutations in patients with transposition of the great arteries and double-outlet right ventricle. Am J Hum Genet 2002;70:776-80. Diano L, Campagnolo L, Vecchione L, Cipollone D, Bueno S, Prosperini G, et al. Hif1α down-regulation is associated with transposition of great arteries in mice treated with a retinoic acid antagonist. BMC Genomics 2010;11:497. D'Alessandro LC, Latney BC, Paluru PC, Goldmuntz E. The phenotypic spectrum of ZIC3 mutations includes isolated d-transposition of the great arteries and double outlet right ventricle. Am J Med Genet A 2013;161A: 792-802. Aune CN, Chatterjee B, Zhao XQ, Francis R, Bracero L, Yu Q, et al. Mouse model of heterotaxy with single ventricle spectrum of cardiac anomalies. Pediatr Res 2008;63:9-14. Yu Q, Shen Y, Chatterjee B, Siegfried BH, Leatherbury L, Rosenthal J, et al. ENU induced mutations causing congenital cardiovascular anomalies. Development 2004;131:6211-23. Shen Y, Leatherbury L, Rosenthal J, Yu Q, Pappas MA, Wessels A, et al. Cardiovascular phenotyping of fetal mice by noninvasive high-frequency ultrasound facilitates recovery of ENU-induced mutations causing congenital cardiac and extracardiac defects. Physiol Genomics 2005;24:23-36. Yan YL, Tan KB, Yeo GS. Right atrial isomerism: Preponderance in Asian fetuses. Using the stomach-distance ratio as a possible diagnostic tool for prediction of right atrial isomerism. Ann Acad Med Singapore 2008;37:906-12. Jacobs JP, Anderson RH, Weinberg PM, Walters HL. The nomenclature, definition and classification of cardiac structures in the setting of heterotaxy. Cardiol Young 2007;17 Suppl 2:1-28. Radiation dose in X-ray and CT Exams. Radiological Society of North America (RSNA®); 2017. Available from: https://www.radiologyinfo.org/en/info.cfm?pg=about-rsna. [Last accessed on 2018 Jul 27].38. Berg C, Bender F, Soukup M, Geipel A, Axt-Fliedner R, Breuer J, et al. Right aortic arch detected in fetal life. Ultrasound Obstet Gynecol 2006;28:882-9.